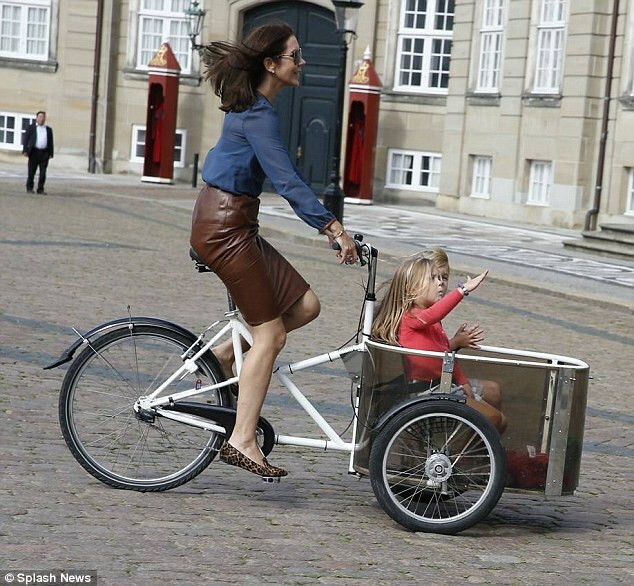 This image comes from a Daily Mail article but if you Google “Princess Mary cargo bike” you’ll see there are lots of images just like this. This is obviously something she does regularly and not just a one-off thing. No wonder she looks so terrific and what a fantastic example – to have a princess cycling her own kids to school. Most other people in her position would a) get the nanny to drop the kids at school and b) use a gas-guzzling SUV to do it. Posted in Cycling, Journal and tagged bikes, Butchers and Bicycles, cargo bikes, cycling, Princess Mary, transport. Bookmark the permalink. She sets a good example but I don’t understand. What is wrong with the bike you already have? It’s getting too small for the kids. I want to upgrade to a bigger one. I encourage you to get another bike(s). It’s just it is so similar to what you currently have. I didn’t realize it was too small for your kids. What are you going to do when they are teenagers? Haha! It’s nothing like Busby. Busby has two wheels and this bike has three. Chaz and Lou by contrast look practically identical and they even have the same number of wheels. 3 wheels? A tricycle 😄 chad and Lou may look the same but they ride very differently. I guess a tricycle would too. It’s not just any tricycle. If you watch the video you’ll see it handles like a bike with two wheels as it has a tilting system. I noticed the bike gives you an uncompromising ride with safe and thrilling turns. 🙂 I wondered if your kids would go flying on the sort of turn demonstrated in the video. Do you think the cargo “hold” in the bike would be big enough for your kids? Not surprised that Princess Mary rides a bike. If you look at the tv series produced in Denmark, most of the characters (except for cops) ride bikes everywhere. A beautiful bike. Very stylish. It does look nice, doesn’t it? It’s only 31kg which is one of the reasons it appeals to me. I think it’s also very interesting how an Australian ended up as a Danish Princess. Nice bikes on this page! Yes, she’s famous in Australia. More so than Kate Middleton whereas most people here have never heard of her.